This workshop was replaced with a FIELD EVENT instead. Friday, August 10th, 5:00 PM to Sunday, August 12th Noon (with an optional extra day), to catch the Milky Way and the Perseid Meteor shower which peaks on the the 12th. REGISTRATION Deadline: July 16, 2018. *Subject to change if we add additional instructors, but we will make sure that there are no more than 8 students per instructor. 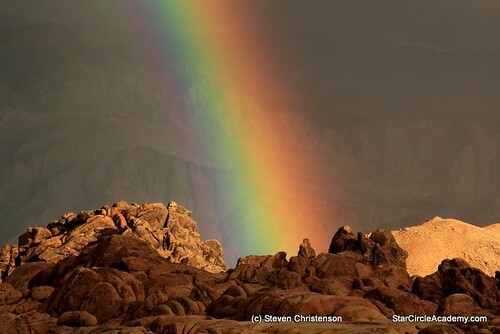 NOTE: This will be an intimate event with one instructor: Steven Christenson, Astronomy Photographer of the Year. Imagine photographing the night skies against the background of Mt. Whitney and the High Sierra! 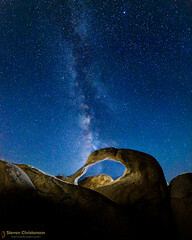 Under the auspices of Star Circle Academy, the Alabama Hills Workshop will be a chance to hone your night photography skills, learn new skills both behind the camera and in the digital darkroom, and come home with spectacular, unique images based upon the stunning clarity and unusual topography of California’s Eastern Sierra and the dark night skies. 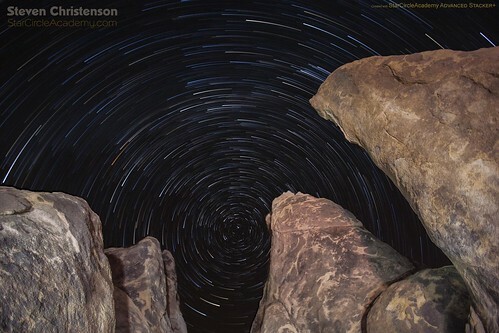 The Alabama Hills Workshop by StarCircleAcademy is for anyone who wants to learn more about the exciting world of digital night photography, or who wants to take their night photography to the next level. We have extensively scouted the location and will take you to fantastic locations that will inspire you. Night exposure basics – and beyond. Tips for getting the composition just right: including sneaky ways to insure your framing and focusing are just as you expect. Getting a compelling foreground using light painting, natural light, and photo processing skills. How to navigate the night sky – find your way around the sky, and learn some key constellations of note for photography. How to capture starry landscapes, and the Milky Way without getting streaks or trails. PLUS we will have astrophotography equipment which we will show you how to use. This equipment is particularly helpful if you do not have a “high performing” camera but wish to capture detailed images of the Milky Way. Special processing techniques and tools to create star trails and timelapse animation. Masterful tips on planning for and then finalizing that fantastic image. Hands on help with your photo processing. Plus much more if time and interest permits. The Alabama Hills Workshop is not for absolute beginners. At a minimum, you should be comfortable with exposure concepts, using the manual exposure controls on your camera, bulb exposures, and working with a tripod. We also highly recommend that you have a DSLR with an optical viewfinder as well as an intervalometer or similar camera control device. We do have some loaner intervalometers available. If you are in doubt about whether this workshop is suitable for your experience level, or if you have special needs, please contact us at Star Circle Academy for clarification. A Liability Waiver is required to attend the workshop. The fee includes classroom rental, in room instruction, use of astrophotography equipment, class materials, and in-the-field instruction. One breakfast and one dinner. Does not include lodging, any other meals, or travel expenses. We strongly suggest you book a room in the Dow Villa Motel or Hotel where the instruction will take place during the days. Mention “StarCircleAcademy” when you make your booking. You can register alone, or together with another photographer and get a discount. If you are bringing a non-photographer friend or spouse who will not be attending classes there is no extra charge. Q: It’s often hot (95 Farenheit is the average high) during the day in Alabama Hills, what will we do about that? A: We will be indoors during the heat of the day doing classroom instruction in air-conditioned facilities. If you book a room in the Motel (newer portion) of the Dow Villa you’ll also have air conditioning. The Hotel portion also has air conditioning, but you cannot individually set the temperature in the Hotel rooms. Our experience with the nights and evenings, however, is that they are usually very comfortable with average lows in the high 50s and low 60s. A: There are no refunds for cancellations unless we cancel in which case we will return 100% of your payment. Note if for some reason we do not book the minimum number of participants, we will provide a full refund. A: Minimally, yes. If you are mobility impaired we may be able to accommodate you – please Contact us before registering, however. Q: Can I pay a deposit? A: No. We expect full payment in advance – via PayPal (though you can use a credit card even if you are not a PayPal member). Q: Is there any discount available? A: Yes. Early sign ups get a significant discount. The Dow Villa is offering modest discounts to attendees. The locations were excellent. There was plenty of space and the choices of shots abundant. All instructors were very knowledgeable, articulate and organized. In addition all were very open to answering questions raised by the content of their presentation. … all in all a great experience. … a perfect combination of talent to lead this incredible workshop. And the location could not have been better. What came through besides your knowledge was the love and enthusiasm for photography. I’m planning to use TriggerTrap for my intervalometer and I have a battery pack to keep my phone charged, but I’m not sure how long that will keep it going. Do you think that will be sufficient or should I plan for something else? I think battery life on a phone depends on a lot of factors, including model of phone, network, etc. I don’t think TriggerTrap itself is very demanding on phone resources in the normal intervalometer mode. I wish I was going to be free to join you for this workshop. It sounds wonderful and right up my street! Those that are able to join you are going love it I’m sure. We’re sorry you can’t make it… but thanks for your praise! I am interested in this workshop but have some questions. Is there a number I can call? Yes, a way to call us is on the Contact Page. But you may find it more effective to use EMAIL to pose your question since as night photographers our availability is hit or miss.